10 Day course drop date with “W” posted on transcript: 9/17/2018 at 3:00 p.m. Semester Grades are posted onto the transcript. 10 Day Course Drop Date with “W” posted on transcript : 2/11/2019 at 3:00 p.m.
As per Board Policy No. 6012, progress report cards and semester grades will be recorded and made available through the Aeries student/parent portal. In addition, hard copy reports will be mailed out to those students who receive a “D” or an “F” at specific grading periods. Withdrawal with failing grade, counts as an F in GPA calculation. 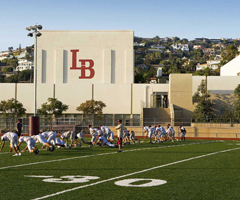 Honors course are approved on a school-by-school basis by the University of California, therefore student’s who transfer into Laguna Beach high school with honors credits on their transcript may be subject to specific transfer policies in interpreting coursework from other schools. Students can always submit their previous high school transcripts to the Universities for evaluation.